Not specified in the narrative, I have set the time of day at late morning. Strong sunlight from the left can be seen on the top, faces & clothes of the two blind men, & on the top & left hand side of the figures in the background. Two blind men in foreground. From left to right in background: James (son of Zebedee and brother of John), Mary Magdalene, Jesus, the synagogue ruler, James/Cleopas (son of Alphaeus). This scene is set just after Jesus has left the synagogue rulers house, having there resurrected his daughter from the death (See Matthew 09:18-26). You can see Jesus (in blue, with a white head scarf) walking away, talking to the synagogue ruler, who is the man in the plum coloured robe. 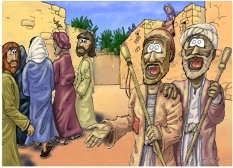 In this scene we can see the two blind men on the right of the picture, shouting out after Jesus, “Son of David, have mercy on us!” I wasn’t quite sure how to show that they were blind. Initially I thought of drawing them with eyes closed, or else with a strip of cloth over their eyes, but that might have been confusing (or not obvious that they were blind) to the viewer. I have only drawn one blind character before, which was Eli in 1 Samuel 03. In that scene (1 Samuel 03 – Samuel’s childhood – Scene 06 – Eli’s advice to Samuel) I drew Eli with white, sightless, staring eyes, so the precedent had been set! I decided to follow my own example & depicted these 2 blind men with the same white eyes, vacantly staring up into the air. I have “borrowed” the background from another Bible Cartoon in Matthew (Matthew 02 – The Nativity – Scene 05 – wise men in Jerusalem) but have altered it & adjusted the colours of the buildings, shadows & highlights.